A herd of elephants visited Maasai Simba Camp last night. Several banana trees in the borehole compound was eaten to the ground. 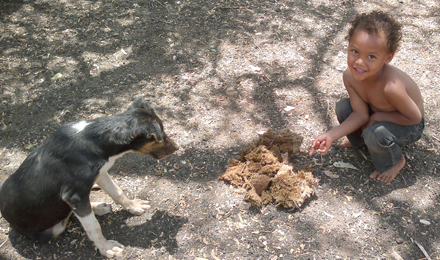 Reteti, the boy pictured here, examined the elephant poo. He discovered that elephants eat lots of different species of plants. He also discovered a variety of seeds in the elephant poo. We used a portion of the elephant poo to fertilize our small garden. 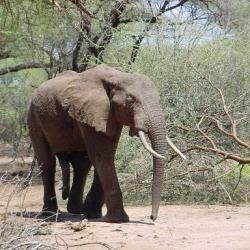 Elephant poo can make good fertilizer! This boy loves animal tracking. Next to him is his dog named Simba.